Port Townsend, today. I have a couple of scrapbooks, started when I was a youngster, so many years ago. Whilst rummaging through them, I found my very first report card. From kindergarten. Reported that I worked well on my own. Also found a note about the name change of Trans-Canada Airlines to Air Canada. That was back in 1965. Now before you remind me this is supposed to be a railroad blog, there is a rail connection to Air Canada. 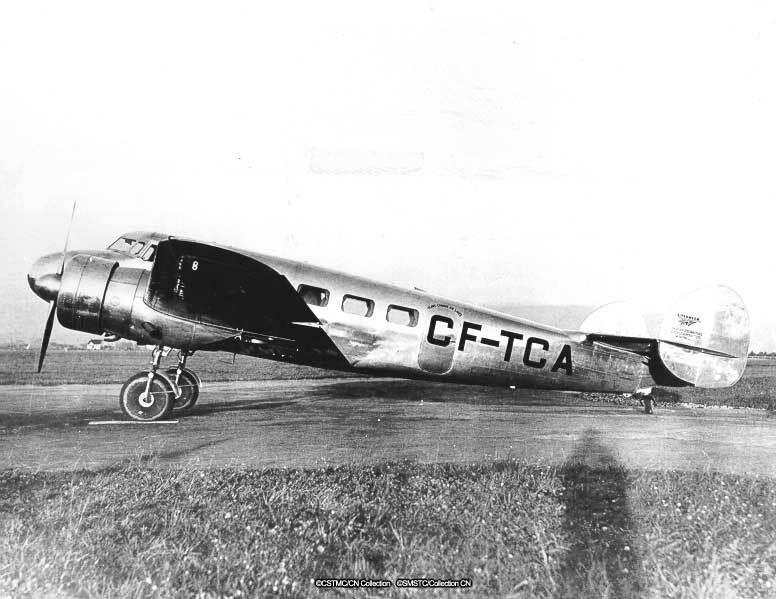 Air Canada began its colorful history as Trans-Canada Airlines (TCA.) TCA was a subsidiary of the Canadian National Railway. However, unlike the Seaboard Air Line (SAL) railroad in the southeastern United States, who never owned an aeroplane, Trans-Canada Airlines did. The first aircraft was a Lockheed "Electra" L-10A, often referred to as the "Amelia Earhart" aircraft. TCA owned five Electra's. The L-10A had seating for ten passengers, plus a crew of two. Ironically, Trans-Canada Air Lines "inaugural" flight did not cross Canada. 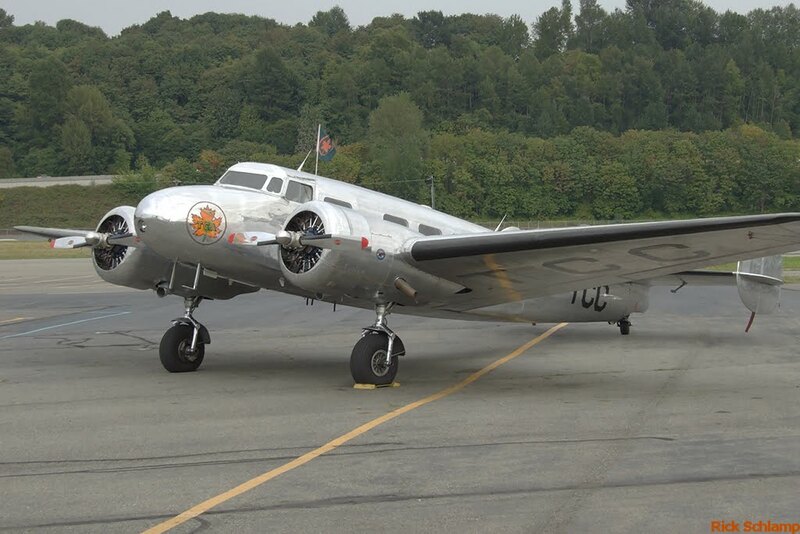 On September 1, 1937, the TCA flight took off from Vancouver (BC) Sea Island facility with 2 passengers and some bags of mail, landing fifty-minutes later at Seattle's Boeing Field, 141 miles to the south. The fare round trip was about $14.00, ($213.00 in 2010 dollars), pricy for the times. From those humble beginnings, Trans-Canada became a first rate carrier. Their success prompted the Canadian Pacific Railways to initiate their own airline in 1942. 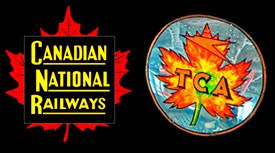 With the reorganization of the Canadian National in the 1970, TCA split with the railroad, and went on to become Air Canada in 1965, becoming completely privatized in 1989. Back in 2007, Air Canada flew the original route, with the original aeroplane, between Vancouver BC and Seattle. The Seattle PI covered the event, as well as Rick Schlamp, who granted us permission to feature his photo in today's Blog. When you open the Seattle PI story, which includes a photo of the passenger section, you can understand why the recommended height of prospective flight attendants was 5'2" to 5'5"! 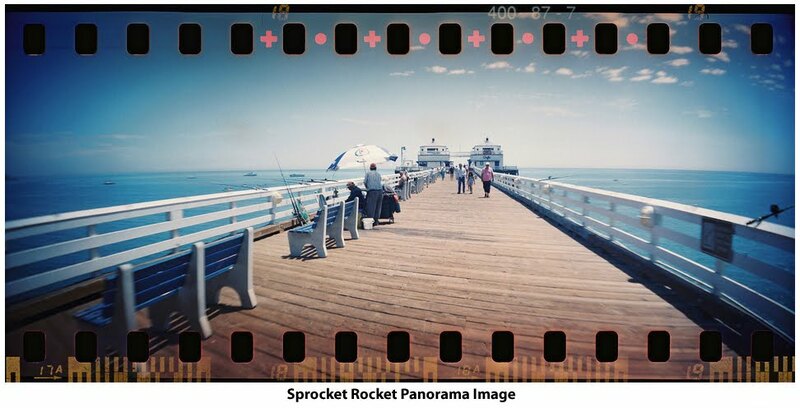 Rick has a great selection of photos up on Flicker that you may enjoy. Some of each - planes, trains, and boats! In his aircraft library, there is a very interesting shot of a "finished" aircraft landing at Boeing field, with a train load of body's heading south to Renton. Neat juxtaposition, as we call it. Today, this aircraft is on display at the Western Canada Aviation Museum in Winnipeg, Manitoba. Be sure to click on "virtual tours" for a virtual tour of a very cramped cockpit! My Sister and I spent many summer vacations with our grandparents in Victoria, B.C. They had a summer cottage out at Patricia Bay, on the Saanish Peninsula. 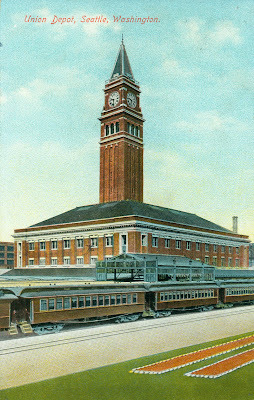 Normally, Mom would drop my sister and I off at the Bell Street Terminal in Seattle. We would take the four-hour trip to Victoria on the Canadian Pacific Steamship, wherein I was instructed by Mom that my younger sister should still be on-board when we arrived in Victoria. One year, Mom got the inspiration to send us by aeroplane, rather than the CPR water route. Her reasoning was sound; Boeing Field was nigh unto our home, the trip would be over in a few hours, and the aeroplane landed at Patricia Bay (Victoria's airport) only a mile or two from the grandparent's summer cottage. About all I can remember about the flight, it was on board a DC-3, it was pure terror; a lot of turbulence and trepidation. The following summer, it was back to the benign CPR water route. Port Townsend, today. 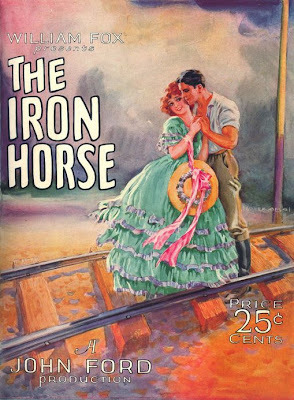 Who among you dare say the days of rails and romance have passed? 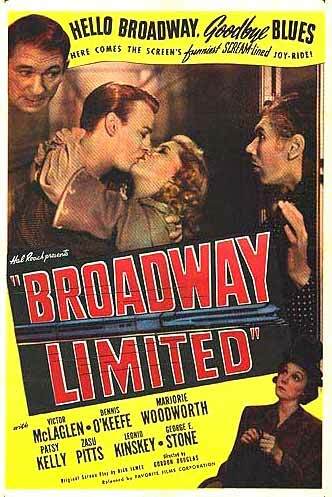 During the heyday of named trains, parlor cars, Pullman sleepers and a cadre of fastidious train crew, railroads were often linked to romance and happy events, captured in big screen classics like "The Broadway Limited, " "It Happened to Jane," and "Twentieth Century." In addition, dozens more films featured dramatic entrances and exits associated with named trains and depots as the backdrop. With the intense news of the past few weeks, it was refreshing to read a "Happy Day" news story involving romance and, of all organizations, Amtrak! 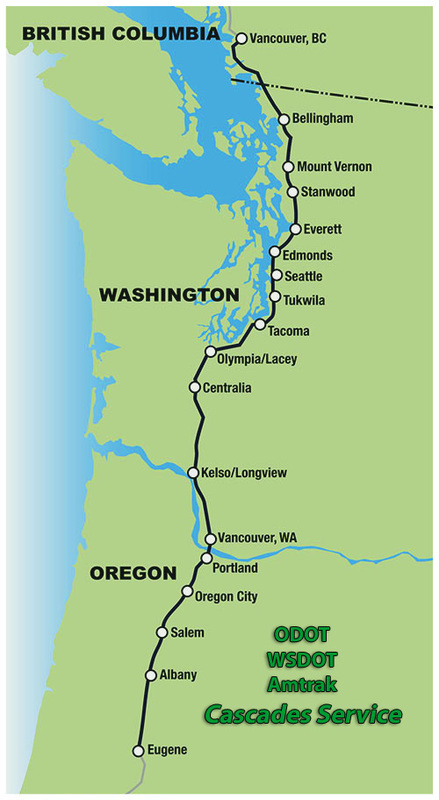 As I understand it, two college students, living on opposite ends of the Amtrak "Cascades" run between Seattle (Washington) and Eugene (Oregon) stuck up a relationship, which, over time, resulted in them meeting "half way" at Centralia (Washington) to spend weekends together. After wooing his intended for seven years, the soon to be groom mustered up the courage to make the proposal, which he wanted to have happen onboard the "Cascades." Susan Gilmore, Seattle Times Staff reporter, gives a full accounting of the Railroad Romance, which included the conductor, a private table for two, as well as how the event came to be captured on video! The groom said he chose the train for to perform the proposal because "The train is special for us, symbolic. It make you slow down in life and bridged long distances between two faraway places." Port Townsend, today. 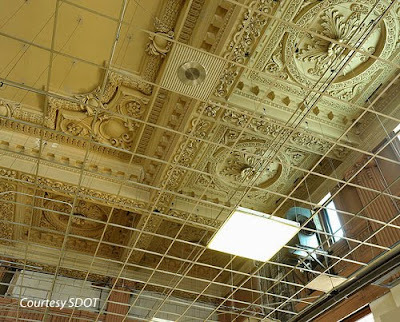 Leland Weiss, in a recent blog article, "The Other Way out of Town " got me wondering about the status of the King Street Station renovation taking place in Seattle. One can only wonder if the post card bears the wrong caption? Well, it is not wrong. As first conceived by James J. Hill, the proposed new station at King Street, would bear the name "Union Depot." This to identify the "union" between the Great Northern and Northern Pacific, which Hill had purchased in 1901. And thus it remained so named for 5 years. Union Depot would also be the southern portal for a new 5,141 foot tunnel under the City of Seattle, to by-pass increasing congestion along the waterfront. With the opening of the Union Pacific - Milwaukee Road joint venture, just across the street, named the Oregon and Washington Station, the traveling public got confused. 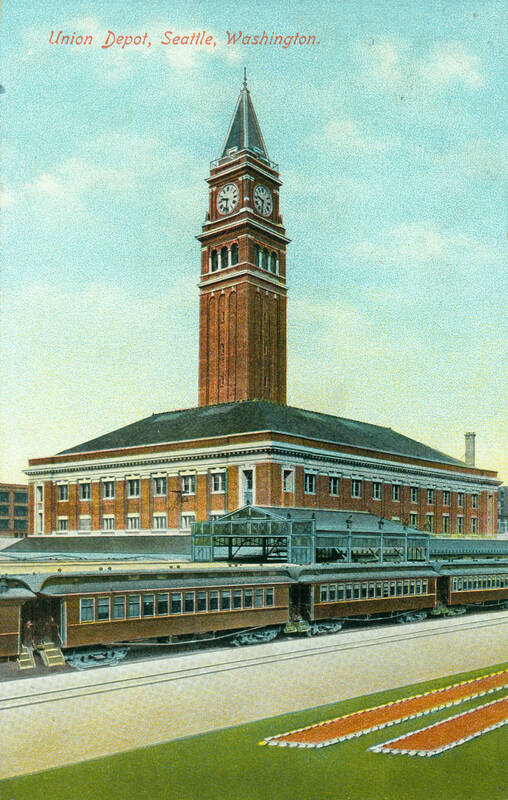 So the Union Depot became the King Street Station and the Union Pacific Oregon and Washington Station was simply renamed Union Station, in 1911. From what I've read on the 'net, some history savvy conductors are referring to King Street by it's original name, causing consternation amongst passengers! 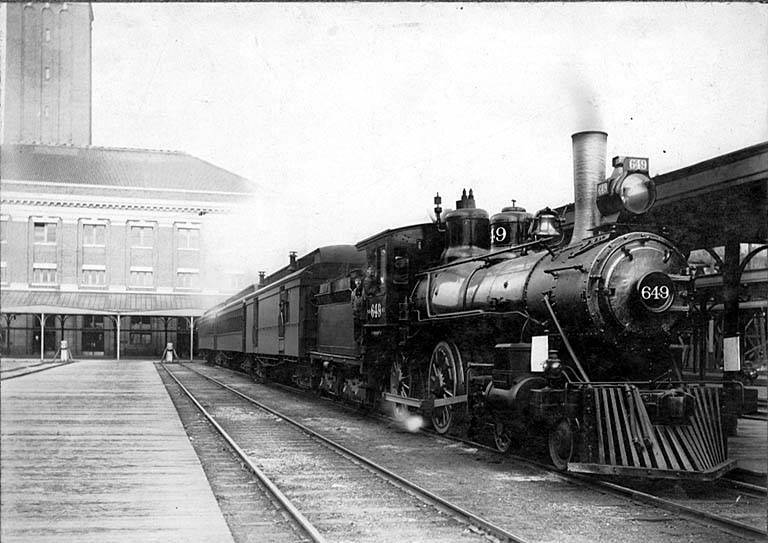 The struggling Northern Pacific finally got into Tacoma, their chosen western terminus, in 1883. After several false starts, the NP finally managed the 30 or so miles from Tacoma, arriving in Seattle on June 17, 1884. 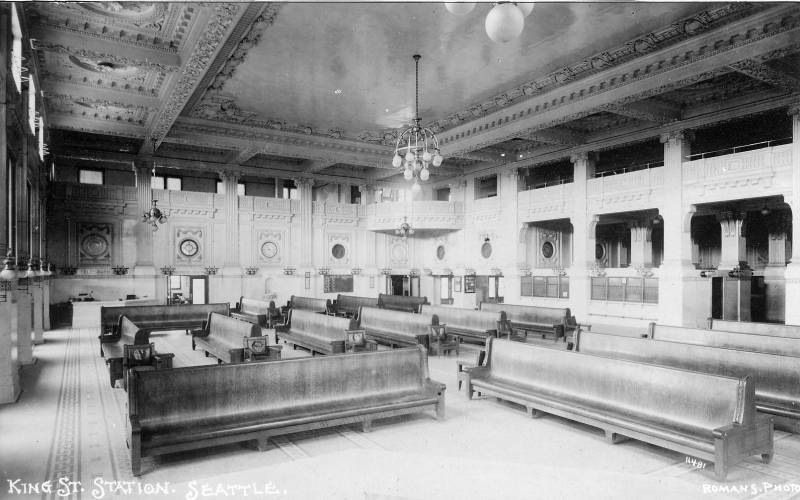 NP's facilities were rugged in the beginning, and took a disastrous turn when most rail facilities were destroyed in the Great Seattle Fire of 1889. The photo above identifies the "Ladies Waiting Room." There is a portly woman in the upper right, facing into the room. This would be Mrs. S.E. Stine, of the Seattle YWCA. She bears the officially recognized title of "Depot Matron." 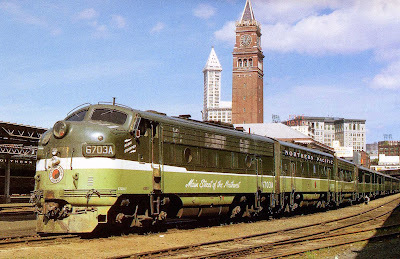 The Great Northern Railroad descended on Seattle from the north, with a line running down the beach of Puget Sound from Vancouver, B.C., joining the Chicago line at Everett, thence south into Seattle. 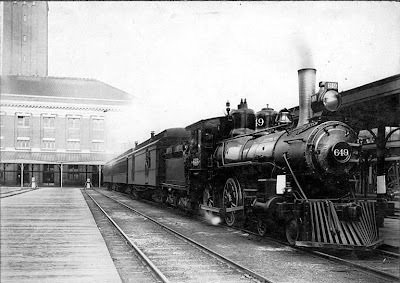 GN's first transcontinental train into Seattle arrived on January 8, 1893. 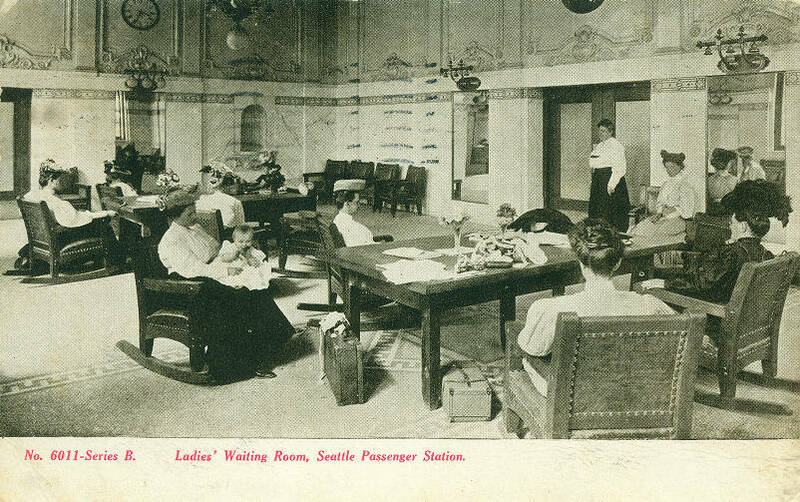 So now, Seattle was hosting two transcontinental railroads, with spartan facilities for passengers. 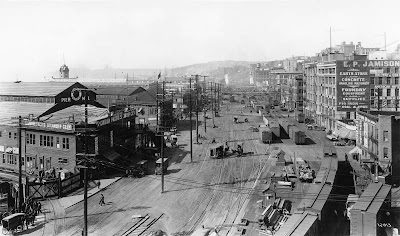 Long story short, Great Northern's Hill bought out Northern Pacific in 1901, and an arrangement was made between the two entities for a jointly funded edifice at Fourth Avenue and King Street. The architectural firm of Reed and Stem was commissioned to design the Station. Construction began January 1, 1905. 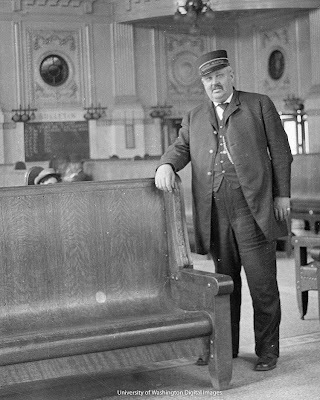 Ticket offices of the Great Northern and Northern Pacific railways were moved the night of May 9, 1906 to Union Depot. The Hill Tunnel and Union Depot were opened simultaneously. The Hill tunnel is a separate story altogether! Rail traffic began entering the city through a 5,141 foot tunnel, by-passing the congested Seattle waterfront, terminating at the station, beginning at 4 a.m. May 10th., 1906. And what a grand structure she was, with her prominent 245-foot clock tower, a replica of St. Marks Bell tower in Venice, with four 14-foot diameter clocks on the cardinal faces of the tower. The tallest structure in Seattle! I really had no reason to visit the station as a young man. But soon after that Big Merger, despite Burlington Northern's pronouncement that "major changes were not anticipated," major changes took place. 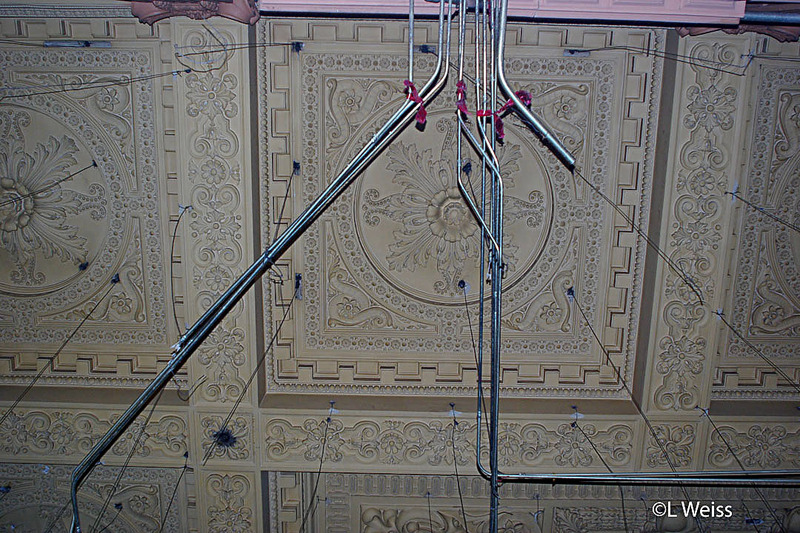 In an effort to "modernize" a station built in the Italian classic architectural, galvanized wires were attached to the beautifully sculpted ceiling, from which a lowered false ceiling was suspended. Fiberglass and metal seats replaced the classic high backed wooden benches. In short, everything about the classical interior was either hidden or removed. There are no records indicating what day, or night, each clock stopped. But the hands recorded the time: North clock stopped at 6:20:55. East clock stopped at 5:20:47. South clock stopped at 11:05:55. West side clock stopped at 11:05:55. 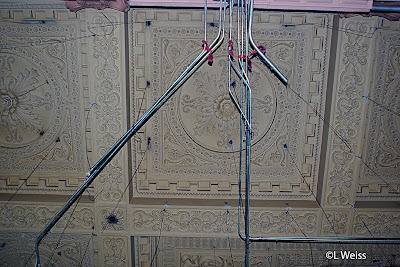 The original terra cotta roof, which never leaked, was replaced with an "easy maintenance" roof, which did leak. As a final disgrace to classic architecture, in 1969, an array of gray fiberglass, microwave dish antennae were bolted to the Tower, with hideous results. So much for the Big Merger, and "post modern" updates. Architects Charles Reed and Allen Stem must have rolled over in their respective graves. It was embarrassing to the residents of Seattle to witness the demise of the grand old station, once the biggest and most beautiful structure in Seattle, second only to the Smith Tower. 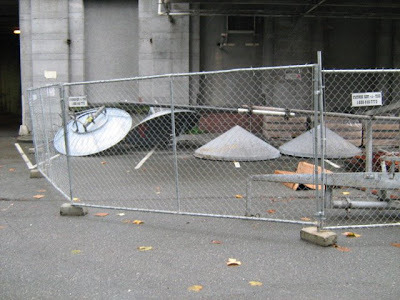 By the early 2000's, the rundown molested building, with ghastly microwave dishes hanging obscenely from the clock tower, was in danger of being torn down. The building had been so thoroughly violated, it took a while to figure out where to start and what needed to be accomplished. Of immediate concern, replacing the leaking roof with original terra cotta tile that did not leak, repair clock lighting, and remove the microwave dish on clock tower. October 21, 2008. 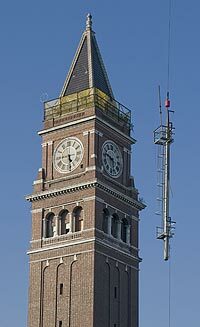 The Seattle Department of Transportation (SDOT) today finished removing the large antenna mast from the clock tower of King Street Station. As part of the restoration of the historic terminal, the department took down the 45-foot tall mast and two nine-foot wide microwave dishes over two days. 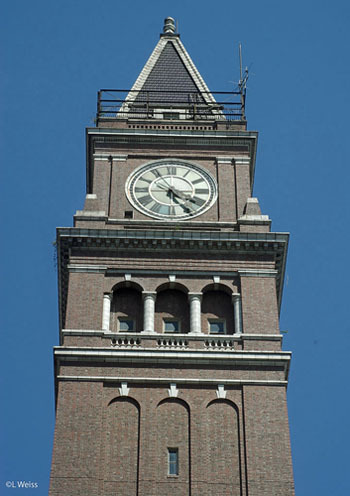 Once used for railroad communications, the 1960's era equipment had long marred the beauty of the 245-foot clock tower. The City of Seattle has created a great outreach website for citizens, where progress reports are regularly posted. And the clocks were restarted in October of 2008, quite a story in it own right! What a proud moment for the City of Seattle when this renovation is complete. 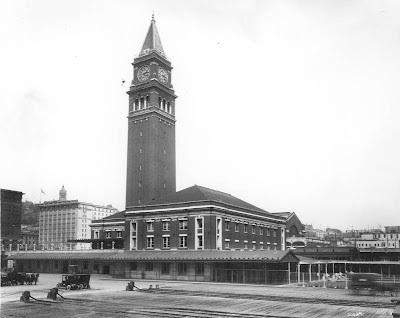 Moreover, the King Street Station Tower can proudly share the Seattle skyline with its neighbor, the 42-story Smith Tower, which replaced the King Street Tower as Seattle's tallest structure, and fourth tallest in the USA, in 1914! 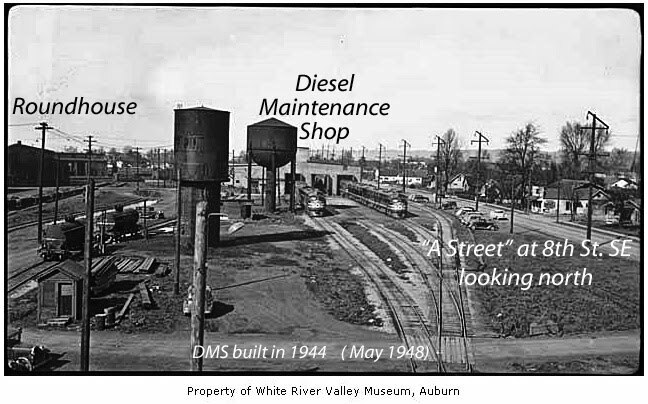 Photo Credits include Leland Weiss, Seattle Dept of Transportation, and University of Washington Digital Collections. Port Townsend, today. More than a year ago, when chatting with one of my neighbors, I - we - were astounded to discover that we share a small piece of Pacific Northwest railroad history! I was telling Dorothy about how I, as a young man, back in the 1960's used to hang out at the Northern Pacific Railway shops in Auburn (Washington.) Amazingly, Dorothy also hung around the same shops, but with much greater clarity than I! "The first thing that comes to mind was the kindness and professionalism of the Porters. 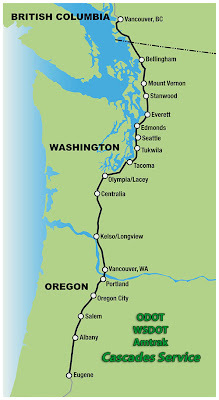 My Mother would put me on the night train from Spokane to Seattle. The Porters would fuss over me and kept an eye on me during the trip. 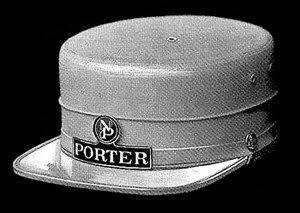 The Porter would make up my bunk. I loved the top bunk. I could really feel the train movement up there. And hear the rails. In the morning, the Porter would tap on my curtain to wake me up. 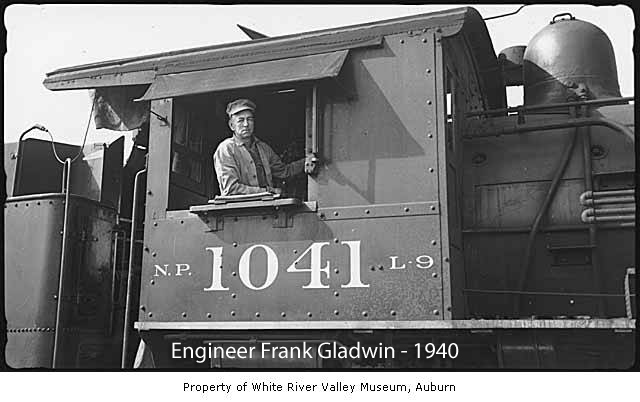 He would make sure I got ready to get off the train in Auburn." Dorothy referrers to her grandmother as "Play Ga-Ga" and her grandfather as "Work Ga-Ga." "Work Ga-Ga" was Guy Wickham. 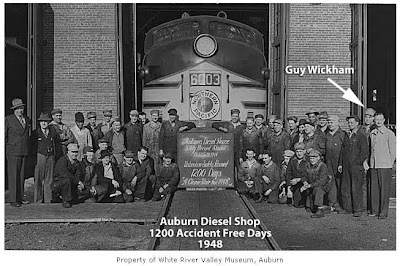 Mr. Wickham began working in the Northern Pacific Railway Shop in Auburn, as a machinist, eventually becoming a Foreman. Mr. Wickham and his cohorts worked through those exciting transitional days from steam to diesel. 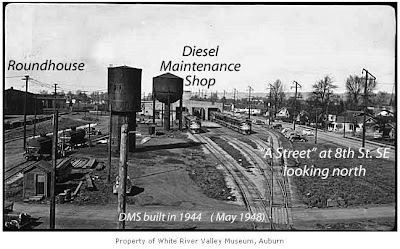 In fact, the Northern Pacific was the first Class One railroad to build a dedicated diesel locomotive maintenance facility, which became the model other railroads emulated. 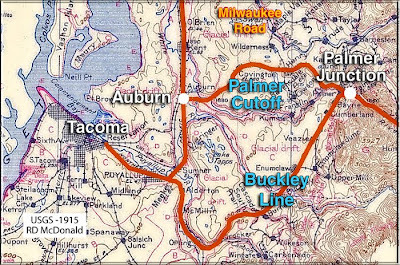 The original alignment of the Northern Pacific from Stampede Pass to Tacoma, took a devious round-about route down off the Cascade Foothills, entering Tacoma from the southeast. 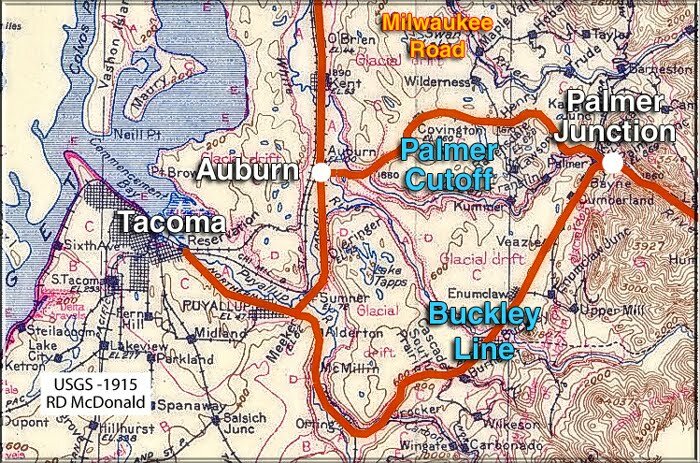 That stretch, from Palmer Junction to Tacoma, was referred to as the "Buckley Line." The map shows the revised alignment beginning at Palmer Junction, with a direct route to Auburn. With the opening of the Palmer Cutoff, on August 19, 1900, the Northern Pacific main line descended directly down off the Cascade Foothills onto the valley floor of the Green - Duwamish River Watershed, intersecting the Seattle - Tacoma line at Auburn. That realignment put Auburn "on the map" - from flag stop to major junction overnight. 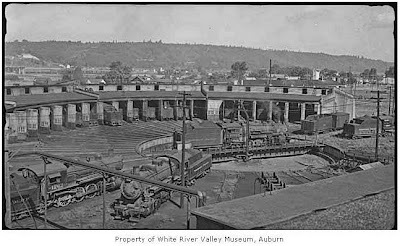 Being strategically located between Tacoma and Seattle, Auburn became second largest facility, next the main South Tacoma Shops, on the West Coast. At its peak employing nearly 2,000 souls. There was a large 25-stall roundhouse. 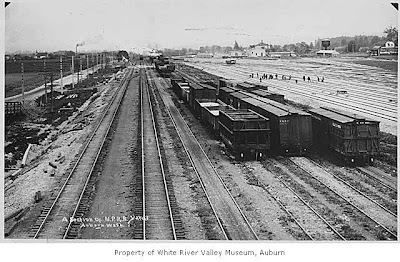 A classification yard, 20 tracks wide, was constructed in 1912. Traffic from Seattle and Tacoma aggregated in Auburn, forming heavy freight movements for St. Paul. 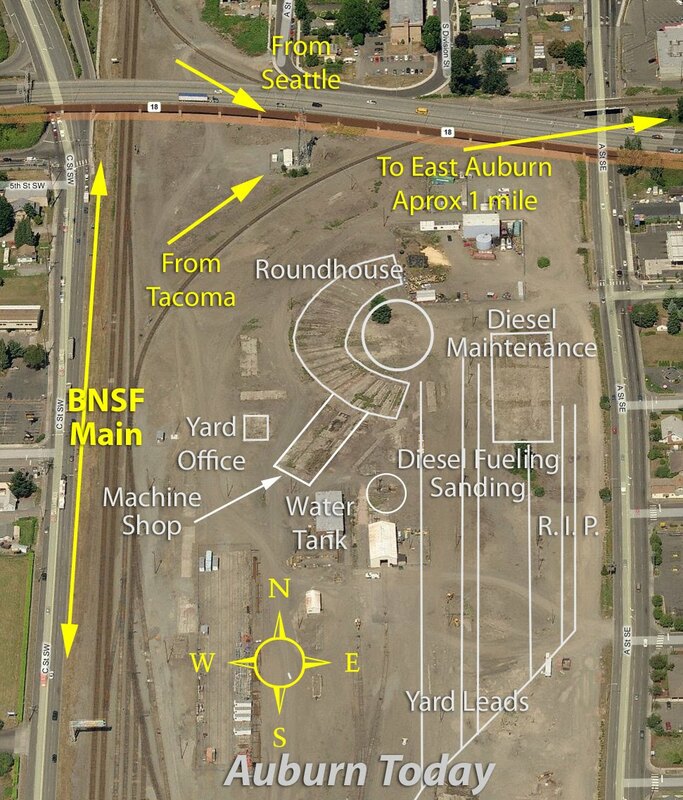 Conversely, westbound heavy freights were dissected at Auburn, separating Seattle and Tacoma revenue. "Machinist Fred Mutterbach, a new hire, with Blacksmith Robert Metcalf, his helper John Lockridge and Foreman Guy Wickham were caught in an explosion. The men had been heating metal in a locomotive cab with a tire heater; a torch attached to an eight-gallon tank of headlight oil under air pressure. A pipe in the tank broke off, spilling oil into the cab and against the part they were working on. It burst into flames which engulfed the cab. Wickham managed to get clear instantly and Lockridge came out with only minor injuries, but Metcalf and Mutterbach were burned extensively. 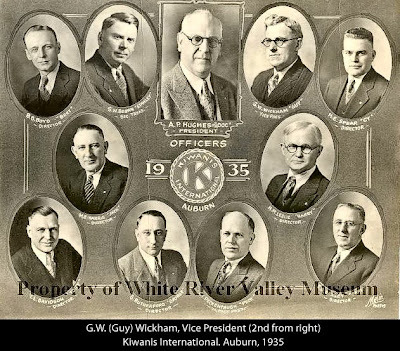 After being treated by the company doctor in Auburn, B. E. Hoye, the men were sent to the Northern Pacific Beneficial Association Hospital in Tacoma to recover." 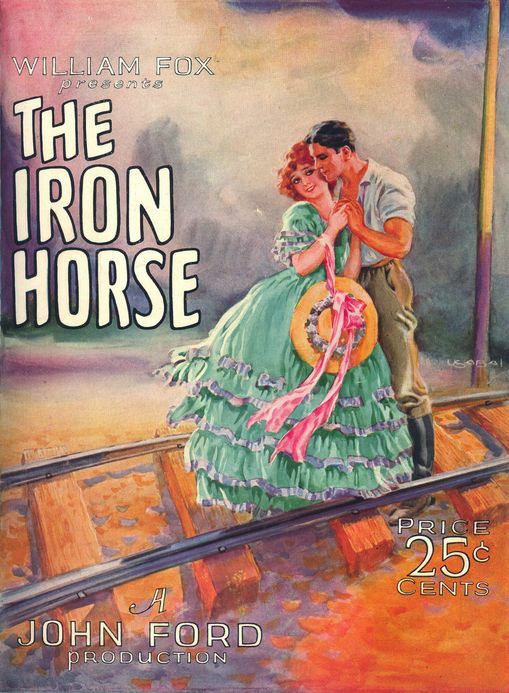 Whenever Dorothy visited, she relished the opportunity to visit the round house and fell in love with the iron horse. As many of us have had the opportunity, we recall the unique smell of "wet steam, " lubricating oil and burning metal. "I can close my eyes and remember the sights and the sounds and smells of the steam, and the oil. I was fascinated by the size of the locomotives in the roundhouse getting ready to go to work. I got to ride in the cab. I remember the big doors opening, and riding out onto the turntable. I remember the loud sound of the clanking rods, sounds of hissing steam and air. I wasn't afraid at all. I got to ride in a lot of steam engines. The men made me feel like a princess. 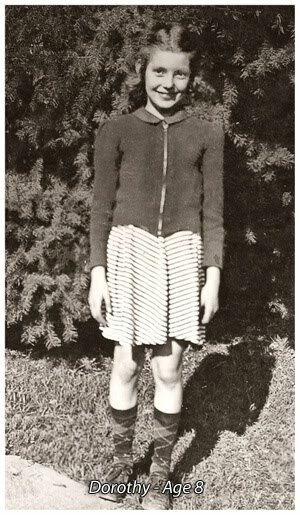 Here I was, a small girl surrounded by big locomotives and big men who were kind and gentle." One day, when she and her Grandpa were standing on the Auburn platform, waiting for the train to take her back to Spokane, she watched the agent deftly enter the arrival and departure times of the passenger lineup on the big chalkboard. Seeing her interest in what the agent was doing, "Grand Ga-Ga" said; "Well Dorothy, when you learn your a, b, c's, and your 1, 2, 3's, you can write on the chalkboard." When the Burlington Northern Merger took place in 1970, it devastated Auburn. And following the usual Corporate Truthspeak of "no major changes anticipated," major changes took place. For a "First Person Account" of how the Burlington Northern Merger in 1970 affected the residents of Auburn, read "Palmer Cutoff." Today, when you ride by on the Cascades or the Sounder, looking out the window, if you didn't know about the Big Yard, the Roundhouse, the Maintenance Shop, the Yard Office, the Locomotives, and the People, it would appear to you as a large flat piece of "industrial property." Mr. Wickham passed away in the late 1960's. Dorothy is in her 70's now. She lights up when we pass in the hall. We share a special bond of Auburn the way it was. For more than a year now, I've been telling Dorothy "I'm going to write about you in my blog." I ran into Dorothy the other day, and told her I was finally writing this article. However, there was something I had forgotten to write in my notes. So when I saw her I asked , "Say, Dorothy; you never did tell me what happened! 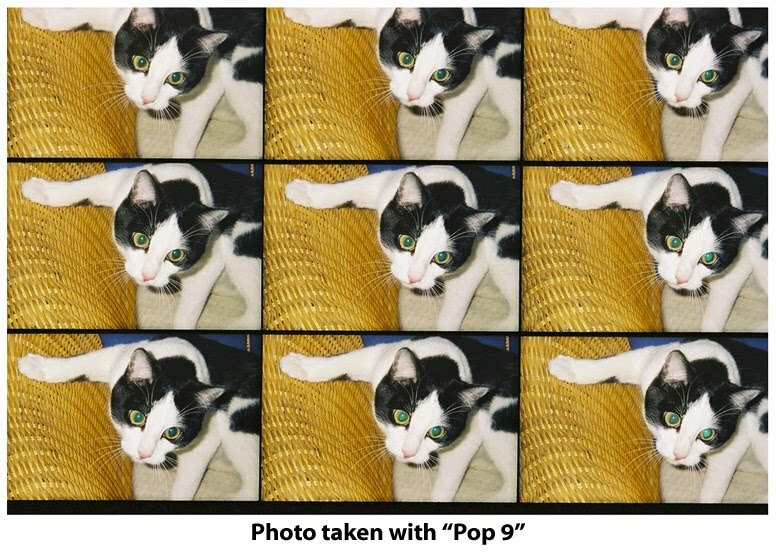 What happened when you finally learned your 'a, b, c's and your 1, 2, 3's?'" "Oh!" she replied with a great big smile, "At last! I got to write on the big (Arrival - Departure) Chalkboard. Just like 'Work Ga Ga' had promised me! I remember the numbers had to be written inside bright orange boxes painted on the chalkboard. I remember holding the chalk, and I used my best penmanship to write in the numbers the Station Agent told me. It was such a thrill to write in those numbers on the Northern Pacific Passenger chalkboard! The( arrival and departure) times for the passenger trains. For everyone to see!" U.S. Representative Gabrielle Giffords will host her first “Congress on Your Corner” of the year on Saturday, Jan. 8 at a supermarket in northwest Tucson. 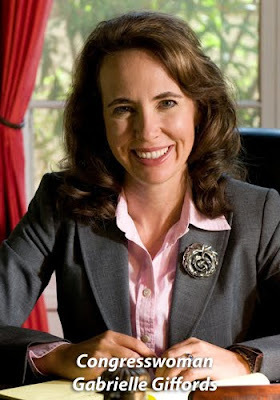 “Congress on Your Corner” allows residents of Arizona’s 8th Congressional District to meet their congresswoman one-on-one and discuss with her any issue, concern or problem involving the federal government. So she went to the rally at Safeway as scheduled and was shot through the head. And six people, including Federal Judge John Roll and a nine year old girl, are dead. Another 13 injured. Gabrielle's husband, Astronaut Mark Kelly, rushed to the hospital in Tuscon, from the Houston Space Center, to be at his wife's side. 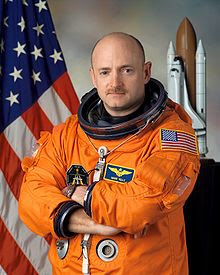 Kelly is the designated Commander of STS-134, scheduled to launch in April. His twin brother Scott is currently on-board the International Space Station. Doctor's have said Giffords' outlook is "optimistic" as she is in critical condition after undergoing surgery. Was today's fatal shooting inevitable? So I call upon you to ask yourself, "What role, if any, does Roger Ailes and his gaggle of misfits at Fox, along with radical radio talk show hosts, share in the guilt in what transpired today?" 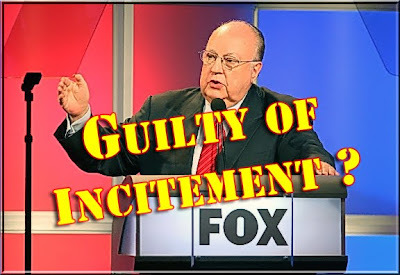 Rather than encouraging constructive, intelligent debate, they vomit a constant steam of misinformation, bellicose discontent and disparaging rhetoric. And what about Palin's Facebook page showing a U.S. map with 20 crosshairs representing districts for House Democrats who voted for the health care bill? 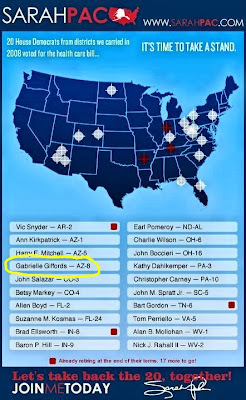 One of those crosshairs was in Arizona's 8th district, to which Giffords was just reelected! In little more than a few months, we've gone from throwing a woman to the ground and stomping on her head, to an attempted assassination of a member of congress, and the murders of a Federal Judge and a nine year old girl with an interest in politics! Tim Profitt, seen here stomping a young lady at a Rand Paul event in October, makes a court appearance on February 22, 2011. Look at what we are capable of doing to each other, simply because we won't tolerate what each other thinks or says? The shots that rang out today in front of a Safeway store in Tuscon Arizona were not only fired at Gabrielle and her neighbors. They were fired at all of us. They are our wake up call! Our prayers are with you and the remaining survivors, Gabrielle. Port Townsend, today. 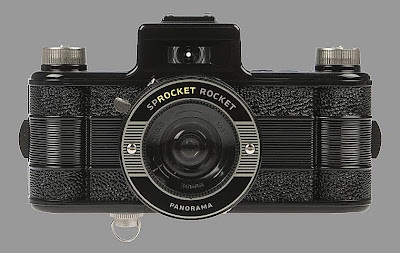 Some time ago I saw photographs taken with an inexpensive little analog camera from China - the cheeky little Holga. The cheap plastic lens yielded images with unpredictable results. The Holga has taken on a life of it's own. 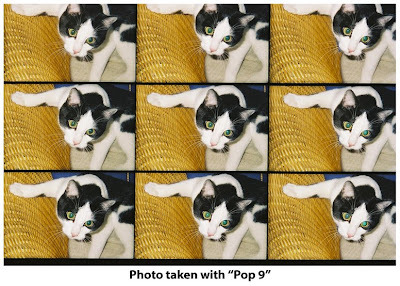 So much so, that "plug-ins" are now available for Photoshop and other image processing programs, for people with first cabin cameras, who want to replicate the "artsy craftsy" output by Holga. But hang on Holga! Another group of off beat analog cameras has come to my attention, such as the "alien camera" with nine lenses, our featured post photo. "Lomography is a global community, whose strong passion is creative and experimental analogue film photography." Lomography has its own version of the ubiquitous pin hole camera, a pinhole camera in a can! 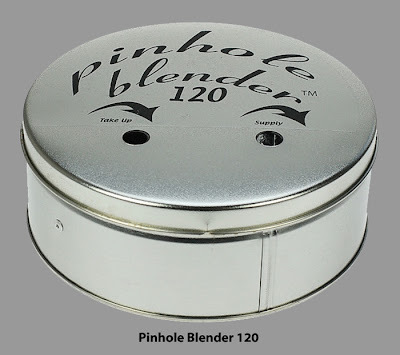 Who remembers the thrill of making your first pinhole camera when you were in Cub Scouts? And actually making a print, moving you ever closer to the coveted Photography Badge. I'm partial to panorama cameras. 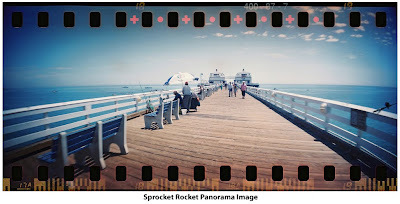 If you have ever priced one, you will appreciate the inexpensive "Sprocket Rocket" panorama camera. 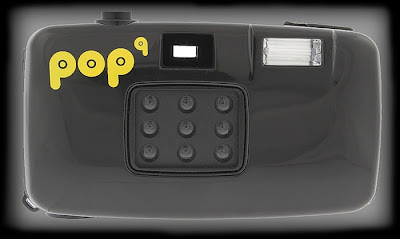 If you are willing to work with the idiosyncrasies of Lomography, you may enjoy shooting with this camera! 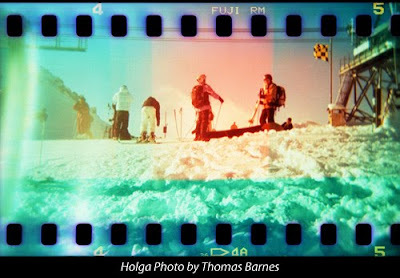 Practitioners of Lomography have formed groups, like this one in Seattle, for sharing the Lomography experience! There are dozens of "unique" and interesting cameras, including panorama, fish eye and even Holga's, on their web site, Lomography, in New York City. Let Jamie know you stopped by! "Thanks" to Jamie for allowing us to share this interesting experience with Oil-Electric. If you are "in the closet" and have taken rail photos with one of these "left of center" cameras, why "come out" and share them with us! Photo credits: Lomography, New York. New Years Day: A New Beginning!